Posted on August 8, 2017 at 1:28 am. MGM Resorts International, one of the world’s biggest casino operators, has just launched its first ever online casino site to players in the US state of New Jersey. The casino platform, called playMGM, offers a full range of online casino and online poker services over websites brands playMGMcasino.com and playMGMpoker.com. 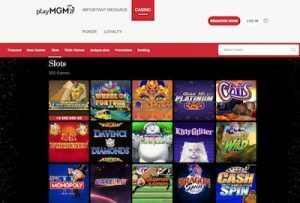 The MGM online casino site offers over 200 online slots and table games, while the MGM poker site features daily and weekly tournaments, cash games and sit-and-go tournaments. Players can hone their skills and try their luck on video poker, blackjack, roulette, craps and bingo across the MGM casino sites. Chief operating officer of MGM Resorts, Corey Sanders, said, “We are thrilled to be entering the online gaming landscape in New Jersey with the expansion of our playMGM platform to include both casino and poker games. The playMGM casino and poker sites are compatible with desktop and mobile play and available on iOS and Android platforms. A welcome bonus is available to new players, with MGM offering a $25 no deposit sign-up bonus plus a 100% matched deposit for any real money transfer up to $2,000. PlayMGM also offers a loyalty program called iRewards, where players can earn points for every real money bet placed at the casino which can later be redeemed at MGM’s online store for cash, casino credits, clothing, accessories, lifestyle and luxury items, and even for hotel stays at MGM Resorts properties. Deposits at MGM’s casino site are available using Visa, MasterCard, Neteller, eCheck and direct bank transfer. Online gambling was legalised in New Jersey in 2013, allowing New Jersey residents to play for real money at any online casino site with an official license from the state. It is one of the few online states to provide a regulated online gambling industry after the Unlawful Internet Gaming Enforcement Act (UIGEA) was introduced in 2006, enforcing some strict laws for online casinos catering to USA players. In line with local laws, players at MGM’s online casino and poker site are required to complete a verification process to ensure they are over 21 years of age and a local resident of New Jersey. Players will need to complete a detailed registration form and provide a social security number and other identification documents to validate their account.